This is our answer to U.S. News & World Report, which relies on crude and easily manipulated measures of wealth, exclusivity, and prestige for its rankings. Instead, we rate schools based on what they are doing for the country — on whether they’re improving social mobility, producing research, and promoting public service. 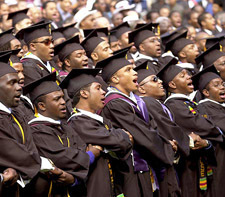 Using Washington Monthly’s criteria, the top liberal arts college in the country is Morehouse College, a historically black, all-male school in Atlanta. based on their contribution to the public good in three broad categories: Social Mobility (recruiting and graduating low-income students), Research (producing cutting-edge scholarship and PhDs), and Service (encouraging students to give something back to their country). “Colleges should be judged not just on who they enroll and how many graduate but on what students do with their lives after they leave,” says Washington Monthly. Indicators used to measure academic quality fall into seven broad areas: peer assessment; retention and graduation of students; faculty resources; student selectivity; financial resources; alumni giving; and (for national universities and national liberal arts colleges) “graduation rate performance,” the difference between the proportion of students expected to graduate and the proportion who do and high school counselor ratings….For national universities and national liberal arts colleges, the U.S. News ranking formula gives the most weight (22.5 percent) to peer assessment scores a combination of the academic peer score at 15.0 percent and the high schools counselor rating score at 7.5 percent. This year’s rankings include a new category often dismissed by other lists: community colleges. Also, in response a rising demand among students for service opportunities, the 2010 report expands what it looks at to determine service rankings: In addition to rating colleges on the number of students participating in ROTC and the Peace Corps, WM factors new factors, including how many students engage in community service, and whether a college provides matching dollars for service-oriented scholarships like AmeriCorps. While the top 20 national universities on the U.S News rankings are private schools, 13 of Washington Monthly’s top 20 are taxpayer supported. South Carolina State and the Newark campus of Rutgers University outrank University of Michigan, University of North Carolina at Chapel Hill, University of Pennsylvania , NYU  and Notre Dame . Five of WM’s top eleven universities are part of the University of California system. Washington-DC area colleges American University, George Washington and the University of Virginia do poorly in the Washington Monthly rankings “because they have Pell Grant rates of 10 percent or less” “Everyone pays for these institutions through tax subsidies and federal grants, but for the most part, only the well-off need to apply,” says WM.